The Mesopotamia Campaign was fought from November 1914 to November 1918 between the Allies represented by the British Empire, mostly troops from the Indian Empire, and the Central Powers, mostly of the Ottoman Empire. History of the Corps of Royal Engineers Volume VII: Campaigns in Mesopotamia and East Africa, and the inter-war period, 1918-38 edited by H.L. Pritchard 1952. Available at the British Library UIN: BLL01008913272. Also available from the Institution of Royal Engineers (InstRE), as a book or part of a CD-ROM. See Volunteer Artillery Battery . Detachments of the Battery were captured at Kut. The majority of the men were from Burma. E H Jones, (refer External links, and Historical books online, below), previously a member of the Indian Civil Service in Burma, was a gunner and subsequently an officer in this Battery. "Trumpeter Inwood, an Anglo-Indian hero of the Kut Garrison" by Rosemary Reardon FIBIS Journal Number 32 (Autumn 2014) pages 18-29. For details of how to access this article, see FIBIS Journals. Wounded and other ill soldiers from Mesopotamia were sent to India for treatment and convalescence. Some of these sadly became part of the group of soldiers who died in India. Troops under the control of the Army in Mesopotamia took part in actions in Persia, and later Transcaucasia. See Norperforce. The Great War Forum, a message board for the First World War, has a subcategory Middle East and North Africa where archived threads may be read. To view images, place a post, reply to a post or search, you need to have registered. See Mailing lists-Military for more details. "Watering the Regiment" from The War Illustrated, 6th July, 1918. "Here, in Mesopotamia, water is life". "Wounded in Mesopotamia" from an official report by Major R Markham Carter. Further information The First World War, The National Archives online exhibition. Mesopotamia Imperial War Museums. Podcast 18 in the series Voices of the First World War. Extracts from soldiers accounts, with a transcript of the podcast. [Diary extracts] Lieutenant Henry Gallup of 1/5th Hampshire Howitzer Battery, Royal Field Artillery was present at the siege of Kut. National Army Museum. "Bombardier Pearse. How He Died. Unwholesome Turkish Biscuits". National Advocate (Bathurst, NSW) 27 Nov 1917 Page 3 trove.nla.gov.au. Bombardier Pearse of the Volunteer Artillery Battery died soon after the fall of Kut. Soldiers' Stories: Major George Campbell Wheeler 9th Gurkha Rifles, won the Victoria Cross while crossing the River Tigris during the Second Battle of Kut on 23 February 1917. nam.ac.uk. Listen to the 1985 interview with Henry Edward Shortt Imperial War Museums. British officer who enlisted at the onset of war and served as Medical Officer with the Indian Medical Service attached to 33rd Cavalry Regt in India and Mesopotamia, 1914-1918. Kurdistan 1919: Military Operations in Mesopotamian Kurdistan: South Kurdistan, May–June 1919. Includes information about many Indian Army Regiments. British-Indian strategy and policy in Mesopotamia : November 1914 - April 1916 by P K. Davis, Phd Thesis King's College London (University of London) 1981. EthOS British Library. The Mesopotamian Campaign: The British Experience in Iraq in the First World War by Donald P Carr , Major, US Marine Corps, 11 February 1991. A paper presented to the Faculty of the Naval War College. Archive.org, Defense Technical Information Center (DTIC) collection. Iraq, 2003-4 and Mesopotamia, 1914-18: A Comparative Analysis in Ends and Means by Lieutenant Colonel James D Scuderi. 19 March 2004. US Army War College, Carlisle Barracks, PA. Archive.org, Defense Technical Information Center (DTIC) Collection. The British Experience in Iraq from 1914-1926: What Wisdom Can The United States Draw From Its Experience? by Matthew W. Williams. A thesis presented to the Faculty of the US Army Command and General Staff College Fort Leavenworth, Kansas 17 June 2004. Combined Arms Research Library Digital Library. pdf download dtic.mil Archive.org version, Defense Technical Information Center (DTIC) Collection. "The First World War Mesopotamian Campaigns: Military Lessons on Iraqi Ground Warfare" by Youssef Aboul-Enein, Strategic Insights, v. 6, issue 6 (June 2005). Calhoun, the Naval Postgraduate School. Monterey, California, USA, an official U.S. Navy website. Forgotten Airwar: Airpower in the Mesopotamian Campaign by Peter J Lambert, 2003 Master of Military Art and Science Thesis, Command and General Staff College (CGSC) Fort Leavenworth, KS. Combined Arms Research Library [CARL] Digital Library. Archive.org version, Defense Technical Information Center (DTIC) collection. Cavalry of the Clouds: Aspects of the Air War in the Eastern Theatre,1914-1918 by C H. Whitley 1997. A thesis submitted in partial fulﬁlment of the requirements for the Degree of Master of Arts in History in the University of Canterbury, New Zealand. A pdf download, which depending on your browser, you may need to locate in your downloads folder. "The AFC In Hotter Climes: The Air War Over The Mesopotamian Desert" by Air Commodore Mark Lax. Part of the conference By The Seat Of Their Pants The Proceedings of the Conference held 12 November 2012 at the RAAF Museum, Point Cook by Military History And Heritage Victoria. Royal Air Force Historical Society Journal 48 2010. html version, pdf rafmuseum.org.uk. raf.mod.uk version. Includes "Only A Sideshow? The RFC And RAF In Mesopotamia 1914-1918" by Guy Warner pages 9-19 and "The RAF Armoured Car Companies In Iraq (Mostly) 1921-1947" by Dr Christopher Morris pages 20-38. En-Dor Unveiled : The Story behind The Road to En-dor by Tony Craven Walker February 2014. html version, pdf, link to other downloads hesperuspress.com. Retrieved 26 October 2014. Contains correspondence from E H Jones, refer "Historical books online" below. He was a member of the Volunteer Artillery Battery (Rangoon Contingent). Very likely this was , or was connected with, the Rangoon Port Defence Volunteer Corps, which had an Artillery section. Articles by Amitav Ghosh: "Shared Sorrows: Indians and Armenians in the prison camps of Ras al-‘Ain, 1916-18". It is based on an account written by an Indian member of the Bengal Ambulance Corps (BAC), who became a prisoner after the fall of Kut. and ended up in the prison camps of Ras al-'Ain, in northern Syria, in 1916. “The reason the story has survived is that one of the Indian prisoners happened to write about about his war experiences forty years later. His name was Sisir Sarbadhikari and his book Abhi Le Baghdad (or On To Baghdad) appeared in 1958” It is in 18 parts, in reverse order, consisting of two pages. Scroll to the bottom of this page for part 1. Scroll to the bottom of this page to continue. ( archive.org links 1 and 2) The earlier part of the memoir, from joining up in Calcutta to the fall of Kut is described in "On to Baghdad". Scroll to the bottom of the page for part 1, or "On to Baghdad", alternative format. Accounts by Captain Kalyan Kumar Mukherji , a member of the Indian Medical Service, originally written in Bengali. After the fall of Kut he was sent to a prisoner-of-war camp at Ras al-‘Ain, Syria where he died in 1917. He was posthumously awarded the Military Cross. His accounts, in Bengali, are available online, refer below. Some excerpts have been translated into English by Amitav Ghosh. Scroll down to the entry The ‘Home and the World’ in Iraq 1915-17: Part 1 to commence. For the final posts, scroll down to the bottom three posts. Written July- August 2012 amitavghosh.com (retrieved 10 May 2014). “Yet another Indian First World War memoir found!” Article about the War Memoirs of Captain Limaye, Indian Medical Service, written in Marathi. He was with the 87th Punjabis 1918-1921. He saw action in Mesopotamia and was involved in operations against the Kurdistanis in 1919 and in quelling the Arab Rebellion in 1920. amitavghosh.com. This book may be viewed online on the Digital Library of India website, refer Historical books online below. "Indian Soldiers and POWs in the Middle East during World War I" by Vedica Kant, Robert Upton, and Chris Gratien, Ottoman History Podcast, No. 86 (December 21, 2012) “ In this podcast, Vedica Kant talks about the experience of Indian POWs in the Ottoman Empire as well as that of Ottoman soldiers captured by the British army and brought to India and Burma, with additional commentary by Robert Upton regarding military recruitment in British India...” Webpage contains images. The history hidden in Haydarpaşa Cemetery by Vedika Kant 01 August 2013. turkishreview.org, now an archived webpage. Holds the graves of some 400 soldiers from what are now the Commonwealth realms who died in Turkey, mostly as POWs, in World War I.
Grandpa’s Journal Harry James Goulter Pearman was with the Army Audit Staff in Mesopotamia. Most of the entries are for 1921. It is difficult for some/all browsers to navigate navigate this site. The following entries contain items relating to issues of fraud by members of the IWT (Inland Water Transport), including the court martial of an officer. 18 April 1921, 26 April 1921, 16 May 1921, 27 May 1921, 27 June 1921, 4 July 1921, 9 July 1921. Troopships, including Hospital Ships 1902-1922 MerchantNavyOfficers.com, now archived. "Kut War Graves - Iraq" "Basra" roll-of-honour.com. Free photographs of Basra Memorial may be requested from British War Graves: War Grave Photographs. Includes category "Memorials to the Missing" which includes Basra Memorial. The Basra Memorial cwgc.org, now an archived webpage. Mesopotamia Campaign 1914-1918 Bilbliography by Joint Services Command and Staff College Library, U K. (Now archived). A pdf download - depending on your browser, you may need to locate it in your downloads folder. Videos: World War One Through Arab Eyes by Tunisian writer and broadcaster Malek Triki. ‪Al Jazeera English. YouTube videos. ‪ Episode One: The Arabs‬ . They fought as conscripts for the European colonial powers occupying Egypt, Morocco, Algeria and Tunisia – and for the Ottomans on the side of Germany and the Central Powers. Episode two: The Ottomans. Includes the history of the Ottoman-Germany relationship. Episode three: The New Middle East. Includes the way Britain and France divided the former Ottoman Empire between them. Map of City of Baghdad from A Handbook on Mesopotamia prepared on behalf of the Admiralty and the War Office [by] Admiralty War Staff, Intelligence Division 1916-1918. National Library of Australia. Also see Historical books online, following. History Of The Great War: The Campaign In Mesopotamia 1914-1918 Volumes I-IV by F J Moberly. 1923-1927. The titles are Volume I: To October 1915 : Outbreak of Hostilities, Campaign in Lower Mesopotamia, published 1923; Volume II: To April 1916: The Attempt on Baghdad, the Battle of Ctesiphon, the Siege and the Fall of Kut-al-Amara, published 1924; Volume III: To April 1917: The Capture and Consolidation of Baghdad, published 1926;	Volume IV: The Campaign in Upper Mesopotamia to the Armistice, published 1927. Hathi Trust Digital Library editions. Note: Missing all/most Maps. Maps are available in the Archive.org versions. Archive.org versions, mirrors from the Digital Library of India: Vol I, List of Maps, Maps at back of book displayed out of order; Vol III, List of Maps, Maps at back of book displayed in reverse order; Vol IV, List of Maps, Maps at back of book displayed out of order. Note, this report also contains the Vincent Bingley report into the medical situation as Appendix I. In addition, separately Appendices To The Report Of The Commission For Medical Arrangements In Mesopotamia Vol-II (July 1916). Archive.org. Volume 1 of these Appendices does not appear to be available online, (National Archives reference CAB19/27). Part II- Maps. IOR/L/MIL/17/15/72/2. Refer Maps above. An Account of the Operations of the 18th (Indian) Division in Mesopotamia December 1917 to December 1918 by Lieut. Col WE Wilson-Johnston 1920 is available in a reprint edition, which in turn is available online on the Ancestry owned pay website fold3 (located in World War II/Military Books/India). The “D” Force (Mesopotamia) in the Great War by J Fitzgerald Lee 1927 is available in a reprint edition, which in turn is available online on the Ancestry owned pay website fold3 (located in World War II/Military Books/Britain). Mesopotamia Campaign in the World War by George B Hunter. From a lecture delivered at the Army War College in Washington, D.C., 1 April, 1930. Link to pdf download (24 pages) Combined Arms Research Library [CARL] Digital Library [USA]. East India (Military): Despatches regarding operations in the Persian Gulf and in Mesopotamia [in respect of Indian Expeditionary Force D] presented to both Houses of Parliament HMSO London 1915. Universitäts- und Landesbibliothek Sachsen-Anhalt. A Handbook of Mesopotamia by Admiralty War Staff Intelligence Division. 1916-1917. In four volumes, (plus a supplementary volume), the first contains matters of a general nature, the other volumes contain a description of the river and land routes, with a map, and a “Gazetteer of Towns”. See Iraq - Historical books online. Includes a Map of City of Baghdad nla.gov.au. "The Control of Flies and Vermin in Mesopotamia" page 23 The Review of Applied Entomology Volume V 1917 Archive.org. "Heat-Stroke" Chapter IV page 51 In Mesopotamia by Martin Swayne (real name Maurice Nicoll) 3rd edition 1918 Archive.org. Heatstroke was also known as sunstroke, and occasionally as insolation or siriasis. From the Gulf to the Caspian : being the souvenir booklet of the 33rd. Motor Ambulance Convoy which served in Mesopotamia and North Persia, 1916 to 1919 written by various members of the unit who remain anonymous. [1920?] State Library of Victoria. This Unit consisted of Army Service Corps personnel, together with Royal Army Medical Corps personnel. The Royal Army Service Corps: A History of Transport and Supply in the British Army, Volume II by Colonel R H Beadon 1931. Archive.org version, mirror from Digital Library of India. Includes the First World War period, with a chapter on Mesopotamia. A History of the Army Ordnance Services, Volume III: The Great War by Major General Arthur Forbes 2nd edition 1932, first published 1929. Archive.org version, mirror from Digital Library of India. Includes a chapter on Mesopotamia. "Inland Waterways and Docks, Royal Engineers in War Time, with special reference to the mystery port of Richborough (Lecture & Discussion)" by Captain A E Battle, RE Proceedings of the Victorian Institute of Engineers 1923-1924, pages 104-116. Includes Inland Water Transport in Mesopotamia, and brief mention of other theatres of war. Melbourne University Digital Collection. "The Motor Cycle in Mesopotamia. Carrying Despatches Through Deep Mud and Blinding Dust" page 70 The Motor Cycle, Volume 17, July 27th 1916 with photographs page 287. Archive.org. "Australians in Mesopotamia" Appendix No.5 The Australian Imperial Force In France During the Main German Offensive. Official History of Australia in the War of 1914–1918, Volume V by C W Bean, pages 703-784. 1937 Archive.org. My Campaign in Mesopotamia by Major General Sir Charles V F Townshend 1920. London edition. Hathi Trust Digital Library. My Campaign: Volume Two by Major General Charles Vere Ferrers Townshend. 1920 Archive.org. From a New York two volume edition. Townshend of Chitral and Kut: Based on the diaries and private papers of Sir Charles Vere Townshend by Erroll Sherson 1928. Archive.org version, mirror from Digital Library of India. Loyalties Mesopotamia 1914 -1917: A personal and Historical Record. From the Outbreak of War to the Death of General Maude by Arnold T Wilson 1930. It is also available as a download from Kurdipedia.org 1936 edition. Loyalties: Mesopotamia; a personal and historical record, Volume II 1917-1920 by Sir Arnold Talbot Wilson 1931. HathiTrust Digital Library. Possibly not accessible in USA etc. Also available as a download from Kurdipedia.org 1936 edition. Also published under the title Mesopotamia, 1917-1920; a Clash of Loyalties. A Brief Outline of the Campaign in Mesopotamia, 1914-1918 by Roger Evans, 1926 Archive.org version, mirror from Digital Library of India. Mesopotamia: The Last Phase by Lieut.-Colonel A H Burne Second Edition 1938 (First edition 1936?) Archive.org. From March 1917. For Indian Army regimental histories, see Hodson's Horse; 9th Bhopal Infantry; 20th (Cambridge's Own) Infantry, Brownlow's Punjabis; 24th Punjabis; 26th Punjabis; 45th Rattray’s Sikhs; 59th Scinde Rifles; 67th Punjabis; 5th Gurkha Rifles; 2nd Battalion, Madras Pioneers; the histories being on fold3 (Ancestry owned pay website). Marvellous Mesopotamia: The World’s Wonderland by Joseph T Parfit, Canon of St George’s Jerusalem 1920 Archive.org. Contains a number of chapters on WW1, commencing with “The Causes of the War”. Also Mesopotamia : the Key to the Future by Canon J T Parfit 1917 Archive.org and Serbia To Kut by Joseph T Parfit 1917 Archive.org version, mirror from Digital Library of India. Full title: Serbia to Kut: an account of the War in the Bible Lands [Balkans, Egypt, Palestine, Syria and Mesopotamia]. An overview of the conflict. The war in the cradle of the world Mesopotamia by Eleanor Franklin Egan 1918. Archive.org The author was correspondent for the Saturday Evening Post. More details in "Writing "Mesopot": Eleanor Franklin Egan on the river to Baghdad, 1917" by David Hudson. On the road to Kut: a soldier's story of the Mesopotamian campaign with 56 illustrations and a map. 1917 Archive.org. The author appears to be an officer from India in a Mule Corps. Mons, Anzac and Kut by an MP (stated to be Aubrey Herbert) 1919 Archive.org. At Kut, the author was liaison and Intelligence officer to Admiral Wemyss, Commander-in-Chief of the East India Fleet. He was engaged in attempted negotiations with the Turks at the fall of Kut, page 229, along with T E Lawrence. Page 99 T. E. Lawrence: In Arabia and After by Liddell Hart 1934 Archive.org. T E Lawrence accompanied Aubrey Herbert, to negotiate regarding the besieged Kut garrison. Extracts from Lawrence’s description of these proceedings, in a letter dated 18 May  from the website A Century Back: Writing the Great War, Day by Day. April 29, 2016. Scroll down. The letter was written to his family, see more details. Tales of Turkey by Major E W C Sandes 1924. Archive.org version, mirror from Digital Library of India..
Turkey in Travail: the Birth of a New Nation by Harold Armstrong (Lately Assistant and Acting Military Attache to the High Commissioner , Constantinople) 1925 Hathi Trust Digital Library. Archive.org version, mirror from Digital Library of India. The initial chapters cover the fall of Kut and the author’s experiences as POW in Turkey. He appears to have then been an officer in an Indian Army regiment. In Mesopotamia by Martin Swayne (real name Maurice Nicoll), illustrated by the author. 1917 Archive.org. The author was a doctor in the British Army working in a mobile hospital. A Message from Mesopotamia by the Hon. Sir Arthur Lawley 1917 Archive.org . The author was a Red Cross Commissioner investigating [medical] conditions. To Bagdad with the British by Arthur Tillotson Clark, 1918 Archive.org. The author, an American undergraduate student, volunteered to work with the YMCA in Mesopotamia, where he ran a YMCA hut in various locations, following the troops. The Thirteenth Hussars in the Great War by Sir H Mortimer Durand 1921 Archive.org. The Regiment served in Mesopotamia from c July 1916. With a Highland Regiment in Mesopotamia : 1916-1917 by One of its Officers. 1918 Archive.org. The author is elsewhere stated to be Harold John Blampied, 2nd Battalion, Royal Highland Regiment (The Black Watch). "The Seaforth Highlanders, August 1914 to April 1916" by H.H.E. Craster pages 309-324 Scottish Historical Review 16, 1919 Archive.org. Includes a Battalion of the Seaforths in Mesopotamia from the end of 1915, taking part in an unsuccessful attempt to relieve Kut. The Leicestershires beyond Baghdad by Edward J Thompson MC 1919 Archive.org. The author was an Army chaplain. Unofficial History by Field Marshal Sir William Slim 1962, first published 1959. Archive.org Lending Library. The first 3 chapters are about Mesopotamia. Slim was then with the Royal Warwickshire Regiment. Mesopotamia, 1914-15 : Extracts from a Regimental Officer's Diary by H. Birch Reynardson 1919 Archive.org, Public Library of India Collection. The author was an officer in the 1st Oxfordshire and Buckinghamshire Light Infantry. Letters from Mesopotamia in 1915 and January, 1916 from Robert Palmer 1916 Archive.org. He went with a draft from the 6th Hants, (Hampshire Regiment) in India since November 1914, to reinforce the 4th Hants. Both these regiments were part of the Territorial Force. He was killed June 21, 1916, aged 27 years. Regimental Records of the Royal Welch Fusiliers (23rd Foot). Volume IV 1915-1918 Turkey-Bulgaria-Austria by Major C H Dudley Ward 1929 Archive.org. A Dweller in Mesopotamia being the Adventures of an Official Artist in the Garden of Eden, with sketches by Donald Maxwell 1921 Archive.org. The author/artist went to Mesopotamia for the Imperial War Museum. Also see the book below The Naval Front. World War I Naval Staff Monographs. Select Volume 4: Mesopotamia and the Persian Gulf to download a pdf. Published London July 1921. Royal Australian Navy website (Select Media Room/Publications/World War I Naval Staff Monographs). This publication is also available to read online at the Qatar Digital Library. IOR/L/MIL/17/15/73. Click on 'About this record' to see List of Maps. History of the Great War based on official documents: Naval Operations.Volumes I-III by Sir Julian Stafford Corbett, Volumes IV-V by Henry Newbolt. Published 1920-1931. Archive.org Volume III Includes Mesopotamia. Volume IV, includes Mesopotamia. Naval-History.net has transcribed editions which additionally contain maps from a separate case for Volume III. "The Tigris Above Baghdad" by Lieut-Comr. A S Elwell-Sutton RN. Scroll to item 15 page 153 The Naval Review February 1923 Vol. XI No. I, produced by The Naval Society. Now an archived webpage. Details of the Caddisfly, one of the 'Fly' class gunboats. "The First Commission of HMS Firefly" by Staff Surgeon FG Hitch RN JRNMS Volume 4, 1918 Archive.org. One of the 'Fly' class gunboats. Also details of other craft on the river Tigris. Tigris Gunboats : a narrative of the Royal Navy's co-operation with the military forces in Mesopotamia from the beginning of the war to the capture of Baghdad (1914-17) by Vice-Admiral Wilfrid Nunn 1932 is available in a reprint edition which in turn is available as an online book on the Ancestry owned pay website fold3 as Tigris Gunboats (located in World War2/Military books/Britain). War in the Air: being the story of the part played in the Great War by the Royal Air Force, Volumes II-VI by H A Jones. Volume V 1935, Volume VI 1937. Part of the series History of the Great War based on official documents. Include Mesopotamia. War In The Desert: An R. A. F. Frontier Campaign by John Bagot Glubb 1960. Archive.org version, mirror from Digital Library of India. Mainly about Iraq in the 1920s. War in the Garden of Eden by Kermit Roosevelt, Captain, Motor Machine Gun Corps 1919 Archive.org. The author was an American, the son of (pre WW1) US President Theodore Roosevelt, who was appointed an honorary Captain in the British Army in August 1917. Page 66 indicates the author was in the 14th Battery, Light-armoured motor-cars (14th L. A. M. B.). The fighting cars were Rolls-Royce. Official Despatches from The London Gazette and details of some Official Documents digitised by the British Library, and other digitised material, are linked from Mesopotamia In The First World War warletters.net. For despatches from The London Gazette from 1919, see further below. Qatar Digital Library Digitisation of content from the British Library’s India Office Records Collection. When looking at a book file, to select a particular page, click on “View all items”. Downloads also available. Mesopotamian Transport Commission. Report of the Commission appointed by the Government of India... to enquire into questions connected with the organisation and administration of the Railway and River Transport in Mesopotamia 1918. IOR/L/MIL/17/15/125/1. This book is also available to read online on the Digital Library of India website, as a pdf download. Archive.org version. 2 Maps issued with the report including "Railway Map of Basra and Magil". IOR/L/MIL/17/15/125/2. Qatar Digital Library. Report for the Army Council on Mesopotamia by Sir John P Hewett 1919. IOR/L/PS/20/35. The report mainly concerns agricultural development, with a section on infrastructure such as ports, railways etc. Qatar Digital Library. Some impressions of Mesopotamia in 1919 by Sir John P Hewett HMSO 1920 Archive.org. 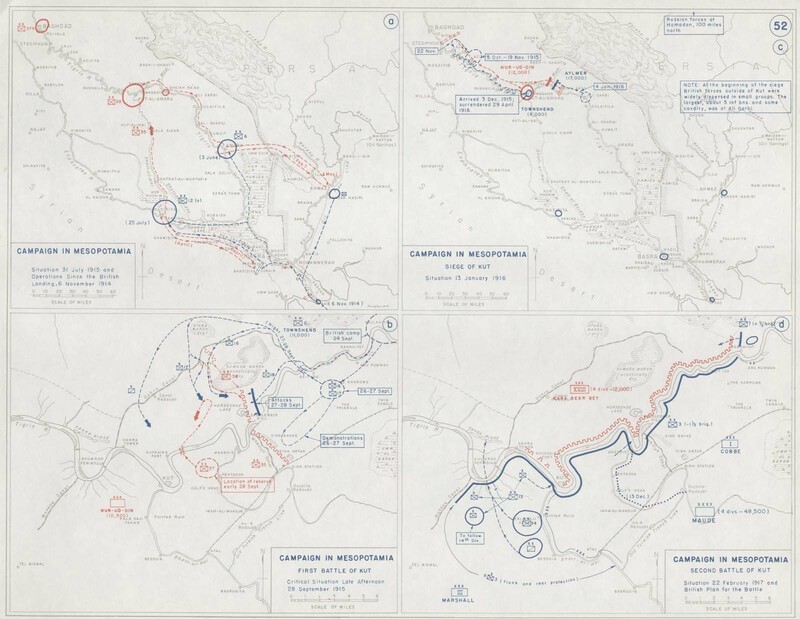 Despatch from Major General Sir George F MacMunn, officiating Commander-In Chief, Mesopotamian Expeditionary Force, describing events since 1st January 1919, including North Persia, and Southern and Cental Kurdistan, for various operations between March and September 1919. The London Gazette 5 March 1920 Supplement: 31813 Page: 2877. The actual pages are dated 8 March 1920. Four Despatches from the Commander-In Chief, Mesopotamian Expeditionary Force: Despatch No 1, dated 17th January 1920 from MacMunn, covering the period November 1919 to 17th January 1920. Despatches from Lieutenant-General Haldane, covering the periods: 18th January 1920 to 30th June 1920 in Mesopotamia and NW Persia. [Despatch No 2 dated 23rd August 1920. Page 5323]; 1st July 1820 to 19th October 1920 [Despatch No 3 dated 8th November 1920, page 5329] Despatch No 4, dated 8th February 1921 (page 5347) The London Gazette 1 July 1921 Issue: 32379 Page:5321. The Letters of Gertrude Bell published 1927. Archive.org, Digital Library of India Collection.Volume I, Volume II. Mainly letters sent to her family. Volume II is in respect of her time in Baghdad 1917-1926. Gertrude Bell Archives Newcastle University, UK. Includes transcribed letters and diaries. The Insurrection in Mesopotamia 1920 by Lieutenant General Sir Aylmer L. Haldane 1922. Archive.org. Missing title page noted. Another version on Archive.org (links to a series of pdfs, most of which contain the text ”on its side”, so may be difficult to read.) HathiTrust Digital Library, accessible in North America and limited other areas only. The Truth About Mesopotamia Palestine and Syria by John de Vere Loder 1923. Archive.org version, mirror from Digital Library of India. Iraq Levies 1915-1932 by Brigadier J Gilbert Browne CMG. CBE. DSO. 1932 . A transcription. “Assyrian RAF Levies”. Also available in a reprint edition, which in turn is available online on the Ancestry owned pay website fold3 as The Iraq Levies (located in World War II/Military Books/Iraq). The Ins and Outs of Mesopotamia by Thomas Lyell 1923. Archive.org version, mirror from Digital Library of India. Iraq: A Study in Political Development by Philp Willard Ireland 1937. Archive.org version, mirror from Digital Library of India. Additional file Archive.org - may require a Djvu or BitTorrent plugin for ease of reading. Includes chapters on the war period, in addition to the post war years. Page 219 The Memoirs Of Sir Ronald Storrs 1937 Archive.org. The author, working for the Foreign Office in Egypt, was appointed Political Officer in Mesopotamia in 1917 to represent the Egyptian Expeditionary Force in Mesopotamia. Field Notes Mesopotamia by General Staff India 1915 (Poor quality print) Archive.org version, mirror from Digital Library of India. When’s When In Mesopotamia by General Staff, Mes. Ex. Force Printed at the Government Press Baghdad 1919. Archive.org version, mirror from Digital Library of India. Conversion tables showing the European style dates from August 1914 to December 1919 and the equivalent dates under various other systems: Arabic - Old Style - Turkish Official - Jewish - Persian Zodiacal. Also details of Arabic time, where the day commences at sunset. The Spoken Arabic of Mesopotamia by John Van Ess, first published 1917. Archive.org, mirror from Digital Library of India. Kalyan Pradeep: Captain Kalyan Kumar Mukhopadhadhaya, I.M.S.-er Jiboni, by Mokkhoda ['Mokshada'] Debi (1928) [Kalyan Pradeep: The Life of Captain Kalyan Kumar Mukherji, I.M.S.] in Bengali may be read online on the Digital Library of India website. The catalogue entry is Kalyan-Pradip by Mokshada Debi There are two book files, Archive.org version 1, mirror from Digital Library of India; Archive.org version 2, mirror from Digital Library of India. Sainyaan'tiila Aat'havand-ii by Limaye Go Gan' published 1939. Archive.org version, mirror from Digital Library of India. Sainyatil Athavani, or War Memoirs of Captain Gopal Gangadhar Limaye. Marathi language with an English Introduction. The author was in the Indian Medical Service IMS, 1918-1921. As part of the 87th Punjabis, he saw action in Mesopotamia and was involved in operations against the Kurdistanis in 1919 and in quelling the Arab Rebellion in 1920. Also see Norperforce, for books relating to actions in Persia and Transcaucasia, under control of the Army in Mesopotamia. On the Poad to Bagdad; a Story of Townshend's Gallant Advance on the Tigris by Lieut-Col Brereton 1917. Archive.org. An adventure story. Carry On! A Story of the Fight for Bagdad by Herbert Strang 1917 gutenberg.org. An adventure story for younger readers. The Legion of Marching Madmen by W J Blackledge c 1936 Archive.org. This book is considered to be fiction, although classified by some as a personal narrative, as discussed in a Great War Forum topic. ↑ Khyber Pass 1/5th Royal West Surrey, Murree, Aug 1916 Great War Forum 28 August 2015. Retrieved 24 April 2019. ↑ The dates of the entries are in the top LH corner of the Home webpage. The entries from the journal are in the format http://www.mespot.co.uk/journal/ab.cd.ef.shtml , where, for a particular entry, ab is the year, cd is the month, ef is the first mentioned day in the month (all two digits). For archive.org diary entries, scroll down to URLs containing the word journal. ↑ An Account of the Operations of the 18th (Indian) Division in Mesopotamia December 1917 to December 1918 by Lieut. Col WE Wilson-Johnston. Naval & Military Press reprint edition. ↑ The “D” Force (Mesopotamia) in the Great War by J Fitzgerald Lee. Naval & Military Press reprint edition. ↑ 29 April 2016: On this day in history T E Lawrence Society on Facebook. Retrieved 4 August 2016. ↑ Tigris Gunboats: A Narrative Of The Royal Navy’s Co-Operation With The Military Forces In Mesopotamia From The Beginning Of The War To The Capture Of Baghdad (1914-1917) by Vice-Admiral Wilfrid Nunn, first published 1932. Naval & Military Press. ↑ Iraq Levies 1915-1932 Naval & Military Press. ↑ Maureene. Fiction/faction/fact? The Legion of Marching Madmen/ W J Blackledge: Online Great War Forum 15 March 2019. Retrieved 17 March 2019. This page was last edited on 24 April 2019, at 13:17.